Juicing: it’s a verb you probably don’t associate with chef culture, but a handful of serious L.A. chefs employ the help of a Breville Juice Fountain in ways that may shock the average Moon Juice customer. “I hate wasting things,” says Jeremy Fox, the Rustic Canyon chef who uses both juicers and dehydrators to coax flavor out of husks, skins, cores, and roots. 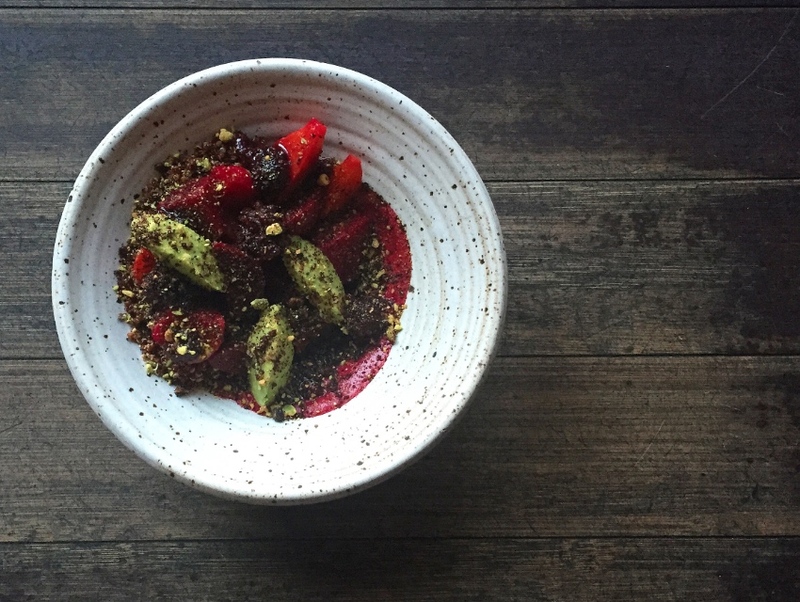 One of the restaurant’s signature dishes, Beets and Berries, incorporates beet juice as well as the dehydrated beet pulp that is left behind after juicing the root vegetables—Fox mortar and pestles the dehydrated beet pulp with olive oil, pistachio, salt, and sugar to form what looks like soil. Beet juice also finds its way into the bar program at Rustic Canyon, where it’s reduced with sugar and Windrose Farm’s dried geranium, taking the place of crème de cassis in a market-inspired riff on the classic Kir Royale (listed on the menu as the Beet Royale). At Union in Pasadena, chef Bruce Kalman brings a similar no-waste mentality to his kitchen, where beet stems are pickled, and cauliflower cores are made palatable by slicing them razor thin. Kalman, who has become a juicing convert in his personal life, has found ways to incorporate his Breville into the menu-prep at Union as well—fresh carrot juice is added to a carrot broth for a hit of freshness. Even the pods of English peas and fava beans are juiced. “It’s insane. It’s so, so, so flavorful,” he says of the fresh pea-pod juice, which he served with roasted porcini mushrooms on last week’s menu. Kalman is quick to cite the shocking statistic that 40 percent of our nation’s produce is wasted from farm to table and, like Fox, he has pledged to use vegetables from leaf to root just as butchers tout the sustainability of nose to tail.